It is recognized that there are many possible agents that might be used by malicious organizations or individuals to attack innocent civilians. 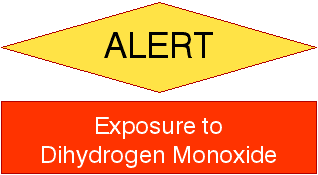 However, the Government has determined that there is a high probability of a Dihydrogen Monoxide event in the next few weeks, rising to virtual certainty over a longer period. This document is being made available to ensure that the public is fully informed. Dihydrogen monoxide is colorless, odorless, and tasteless. Inhalation of its most common form can prove quickly fatal. Exposure of the skin to the vapor can result in severe blistering. Even in solid form, prolonged contact can cause tissue damage. Hand weapons that can actually project quantities of DHMO are fairly readily available, but are only effective at very short range. Governmental and other agencies have been known to use much more powerful 'cannon' projectors. Individuals with much more limited resources (some teenage, or younger!) have been known to simply fill flexible elastic bags with the agent and launch them manually against their opponents. By far the most common reason, however, for exposure to the agent is aerial bombardment from high altitude. This can occur over wide areas. DHMO does occur naturally in some localities,even over great expanses, but be aware that it is commonly contaminated with quantities of such substances as Sodium and Chlorine, both highly dangerous in themselves. (Sodium can ignite spontaneously, and Chlorine is a lethal poison.) You may imagine what effect a combination of these might have. Suitable clothing may be of some help, but seldom provides total protection. The best precaution is to carry a fluid deflector shield. This device is usually constructed of an impervious fabric, stretched over struts to form a portion of an approximate sphere. A rod attached to the inside surface allows manipulation into the path of the agent. It is collapsible for easy transport.